Why do the Yankees win so often? Sure, money may have something to do with it. But the real reason is juju, as practiced by Hart Seely and his pals. You can learn all about the rules -- both do's and don'ts -- from this hugely entertaining and sometimes deeply touching memoir. Seely's wit, energy, and passion erupt from every page. Reading The Juju Rules is like spending a perfect, sunlit day at Yankee Stadium, ice-cold brew in hand, next to your new best friend. And it's a double header. And they win both. In extra innings. Did you know there is a secret to winning ballgames? It’s not the players, managers, money, or luck. It’s juju, and no one knows it better than Hart Seely. Seely has spent a lifetime practicing the art of juju from his living room. And winning ballgames for the New York Yankees. He paces floors. He yells at defenseless TVs. He rallies the team like Churchill addressing the collective British soul. But what he is really doing is harnessing juju energy to influence the outcome of games. And it works. In this uproarious, unforgettable fan confessional, Seely shares the basics of juju for the beginner—“Setting the Table,” asking for a called strike instead of a walk-off homer—to advanced juju—“Bringing the Neg,” predicting bad events to keep them from actually happening—to the deepest, darkest formulas of this age-old art. Along the way readers come to know Hart and his hilarious band of fellow juju practitioners, a secret club of friends whose fandom bonds them across decades, not to mention won/loss columns. Nostalgic, heartwarming, and laugh-out-loud funny, The Juju Rules is a memoir of a life well-lived in service to one’s team that shows how love can be a powerful passion in the best way. Hart Seely is an award-winning reporter for the Post-Standard newspaper in Syracuse. His humor pieces have appeared in The New Yorker, The New York Times, National Lampoon, The New Republic, Village Voice, Slate, Spy and NPR. He has written or edited five books, including O Holy Cow: The Selected Verses of Phil Rizzuto and Pieces of Intelligence: The Existential Poetry of Donald Rumsfeld. Seely lives in Syracuse with his wife, Janice, and three children. There, from his living room, he wins baseball games for the New York Yankees. "As he chronicles his unique relationship with his father (a fan of any team playing the Yankees), learning to appreciate the wisdom of Yankee announcer Phil Rizzuto while listening to games with his grandmother, pursuing the love of his life and commiserating with a comedic stable of Yankee-loving (and Yankee-hating) pals, genuine moments of pathos, heart and happiness emerge." "Seely...weaves his life as a Yankees fan with instructions on how to apply the rules in a fast-paced, hilarious fashion—at times touching, but never dull...This rollicking exposition unveils a rabid fan who claims to have a 'Jekyll/Hyde' complex with respect to the Yankees. There is no Jekyll or Hyde—there is only Seely, a true fan." "Hart Seely’s use of 'juju rules' in support of the Yankees is not only curious, hilarious and excessive but also familiar! His 'off the wall' tennis ball game (played at home to spur a Yankees rally) was also a backyard passion of my own. Clearly Hart comes to the classic fanatic level, and this chronicle of his life as a devoted fan is entertaining – and universal." "Part George Bailey, part Yoda, part screaming superfan, Hart Seely has written a hilarious memoir that gives fans everywhere the mystical tools they need to win games from hundreds of miles away." "A heart-warming, hilarious story about being a Yankee fan? It must be a joke, right? And yet, here it is. 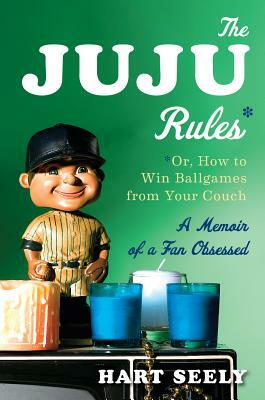 The Juju Rules is a wonderfully-told story that reminded me why I fell in love with baseball in the first place. You don't have to root for the Yankees to enjoy this book, but it certainly helps. Hey, Red Sox fans: I'd like to see you top this!" "I kept waiting for Hart Seely’s The Juju Rules to stop being funny, but it never did. Seely tells the story of all of us who have ever sat in a favorite chair knowing that if we got up to go to the bathroom at the wrong time it could doom our team to defeat and maybe even cost us a pennant." "I used to think Iwas a crazy Yankees fan, but Hart Seely has me beat by a grand slam. The Juju Rules is in a league of its own – a self-help book for baseball addicts, a story with hilarious jokes and zingy one liners, a satirical look at sports and popular culture, and a truly poignant memoir. The scene in which the author watches a Yankees game while his wife is in labor is now my go-to image whenever I need a laugh. No fan should even consider following the 2012 season without arming himself with this book first."